Donning a tacky holiday sweater can do more than just elicit chuckles from friends, family, and co-workers. This year it can help raise critical funds for cancer research, as Stand Up To Cancer is launching its inaugural "Ugly Sweater Holiday Campaign." Weber Shandwick is gearing up with its client SU2C to help raise awareness through numerous holiday activations – all featuring the at-times beloved, and much mocked, ugly sweater. During December, Weber Shandwick staffers are encouraged to shoot a video or photo testimonial which states, "This season I'm getting ugly for..."
As one out of every two men and one out of every three women will be diagnosed with cancer in their lifetimes, most of us probably have someone to “get ugly” for. All who produce testimonials – from executives to employees – will be encouraged to share them on Weber Shandwick's social intranet, through branded social channels, and on personal pages. Everyone participating can help raise awareness for this fundraising and awareness building effort by sharing, liking, and mocking the swarm of ugly sweater pictures posted on Facebook, Twitter, and Instagram with the hashtag #uglysweater. In addition to sharing photos and videos, participants will fundraise through www.su2c.org/ugly. Participation is easy and can be done in two ways. 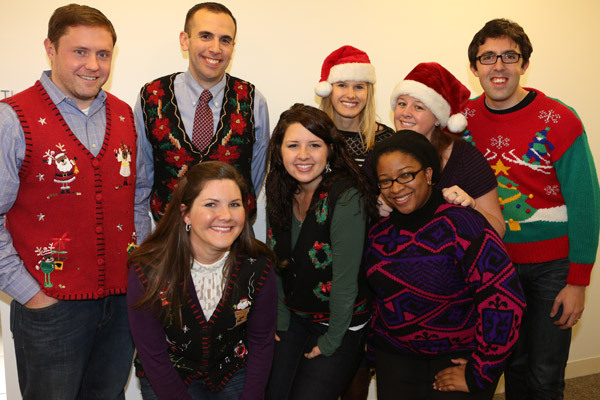 Ugly sweater owners can decide how many days between December 1 and 31 they will sport their unflattering casual wear. They then sign up at SU2C.org/ugly to create their own Ugly Sweater fundraising page, where supporters can donate a ‘per day' amount to benefit SU2C. Additionally, Weber Shandwick will be adding an ugly element to its holiday celebrations across North America and fundraising at those events as well. The festivities will embrace the theme where everyone dresses in ugly sweaters and/or stages an ugly moment where people wear sweaters to show support, and capture the content. All proceeds raised through the Ugly Sweater campaign will go directly to funding SU2C's groundbreaking research. SU2C brings together scientists from different disciplines across multiple institutions to collaborate on research that will deliver new therapies to patients quickly and save lives. Since it was founded in May 2008, more than $260 million has been pledged to SU2C for cancer research. That money has helped fund more than 300 researchers from over 60 leading institutions who are working to develop new ways to treat cancer.